Although smoking is known to cause lung cancer,The Los Alamos National Laboratory① in the US has released data of the cancer risk by smoking in Science, one of the world’s top scientific journals. As a result of analyzing more than 5,000 people examined at cancer and medical institutions and investigating the relation between smoking and cancer development, We understood smoking contains more than 70 kinds of substances that damage cell genes and cause DNA mutations. After genes are damaged, as a result of repeated cell division by damaged cells (non-normal cells), cancer is more likely to occur. 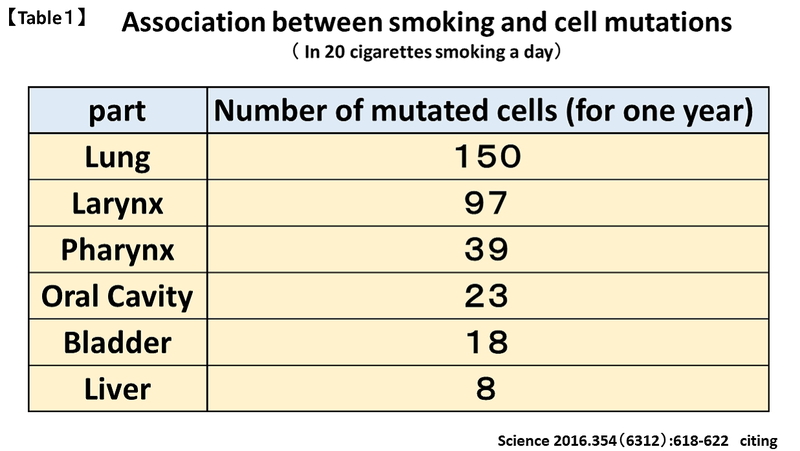 More than 20 smokers a day had 150 mutations in lung cells. Cell Mutation means that it is more likely to become cancerous. It is estimated that smoking is strongly involved in the development of lung cancer. Not only that. It has been surprisingly confirmed that a lot of mutations occur in other parts of the body. It has been said that smoking is closely related to laryngeal cancer, pharyngeal cancer and oral cancer, but it is surprising to find that it also affects bladder cancer and liver cancer. This report② summarizes the results of research conducted with the cooperation of countries around the world. According to a research group in Netherland, people with high zinc and iron blood concentrations have found that the risk of lung cancer is considerably lower. I examined 5435 people of 55 years and over for about 15 years. It appears that DNA mutations by DNA damage are reduced and the production of cancer cells are inhibited. Genes are damaged by reactive oxygen. The gene-damaged cells repeat division and become cancerous at last. It will be much better for us to take nutrients such as zinc and selenium eliminate reactive oxygen species on a daily basis. ALFLAT® includes the powerful antioxidant ingredients like a zinc, selenium, vitamin C etc.